Back to Home Back to News & Tour Back to Tour news Back to 2019 Back to April Back to What's it like to play with Masters marker Jeff Knox? What's it like to play with Masters marker Jeff Knox? 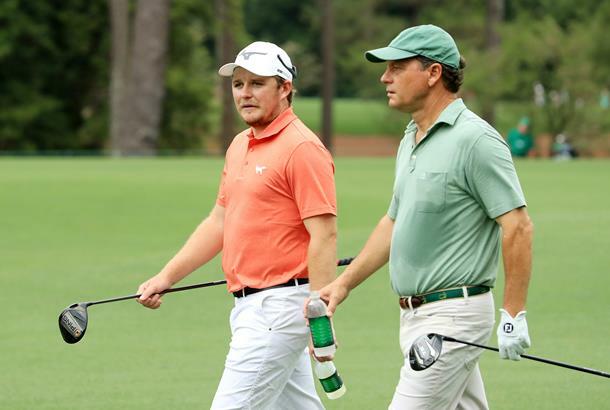 Eddie Pepperell was the first man out in round three of the Masters, and it meant a welcomed tradition for the Englishman: a tee time with marker Jeff Knox. Knox, who has become something of a legendary figure at Augusta National, has played with (and beaten) some of the best names in the game - including the likes of Rory McIlroy and Sergio Garcia. His expertise around the Masters course has also led players like Justin Thomas and McIlroy to seek out his advice, but what is it like to play with him? "I wasn't sure I was playing with him until I saw him on the range hitting balls, actually," Pepperell explained, as rumoured reports on social media speculated it would be another player rather than Knox teeing up on Saturday. "And then I saw him swinging it and I thought I'm in trouble. Yeah, he has a really nice swing, I mean the course is probably a little too long for him at this point, but man he's a good player and his short game was brilliant. And he was nice, really good to play with, actually, so dare I say it, he's the friendliest professional that I ever played with. "I heard it was going to be someone, so that, you know, it's quite nice, I always thought I would just go out on my own and get it over with in two hours but it is nice to have company actually, and especially someone like Jeff because there's no pressure on him, obviously he's, you can talk as much or as little as you like and I like to talk on the course, so he's perfect. " Did you get the better of him, Pepperell was asked? "I did, I did beat him, so you can actually report that," said Pepperell after a level-par 72. "I don't want you to miss that. Going around I did beat him. Which makes me better than Rory McIlroy, apparently." "I gave him a putt on 15 from five feet right‑to‑left downhill I said pick it up Jeff and he refused to take it and then he missed it and he said, I should have taken it. "I was pretty generous, I wanted to be really generous just in case he did beat me and then I would have an excuse. But, no, he, yeah, I wish I could have picked a few up."